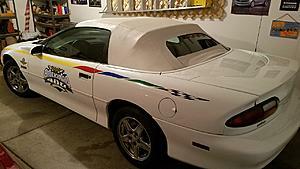 This is my Dad's 1997 Brickyard Festival Camaro Z28 convertible. He purchased it in 2002, condition is good with 88500 miles on it. He is having heath issues and I need to sell the car but have limited knowledge of a fair price for it. I would appreciate suggestions of a fair price for my dad and for the potential buyer. Hopefully someone can offer some input on that specific model. Before you go any further though, do a search online. I thought they were all 30th Anniversary models with the wide Hugger Orange hood stripes, plus the wheels were painted white. And no body side molding, so the decals would sit flat. Yours doesn’t have those. Door decals were also significantly different. Did any authentication paperwork come with the car? Some of the confusion may come from the fact he actual pace car for the 1996 Brickyard 400 was a Camaro matching the above. Additional promotional cars were built be GM, and they were sold off by GM as 1997 models. 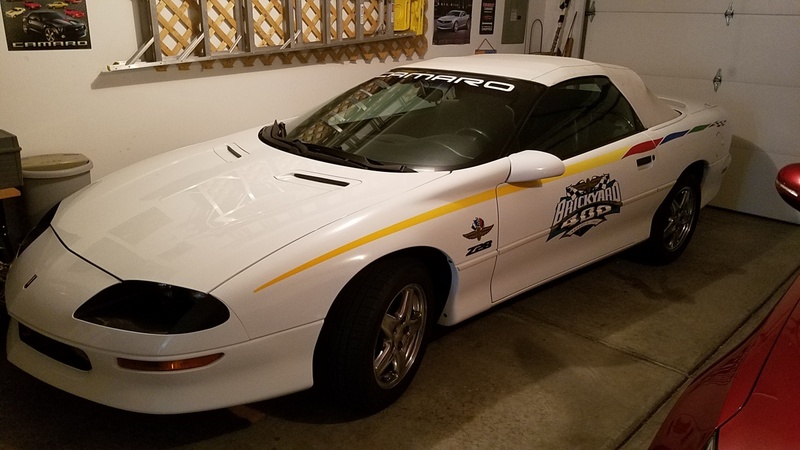 Appears there were also Camaros built for the 1997 Brickyard 400 event, even though the pace car was a Monte Carlo. At least two dealers selling cars similar to yours. Last edited by Injuneer; 07-03-2018 at 05:07 PM. Before you go any further though, do a search online. I thought they were all 30th Anniversary models with the wide Hugger Orange hood stripes, plus the wheels were painted white. And no body side molding, so the decals would sit flat. Yours doesn’t have those. Door decals were also significantly different. Fred, the key to identifying what year a Camaro was used at Indy is to look at the date on the door graphic, it gives the date of the race the car was used at. You're right, the orange and white 30th Anniversary Model was used at the 1996 race and the model shown here was used at the 1997 race. Both were 1997 model year cars. Only the cars used for the race ceremonies received the graphics package and most were removed after the race. The VIN for this car falls well within the known range of VINs, so I don't think there is a problem with being a clone. As for price, that's hard to say. There was one just on Ebay last week that got a high bid of 15K with the reserve not being met. The car had 1600 miles and was like new. I've seen cars with less mileage than yours in the $10 to $12 range. Really going to depend finding the right person. If your wanting a fast sell, you may have to be willing to ask less. Last edited by peterpar; 07-05-2018 at 11:52 PM. I received some information yesterday on this car from records kept at the track. It was Car #22 and was assigned to the IMS Staff. The car had 168 miles on it when it was turned back in after the race and no damage was reported. There were a total of 49 Camaros used at the 1997 Brickyard 400 race. 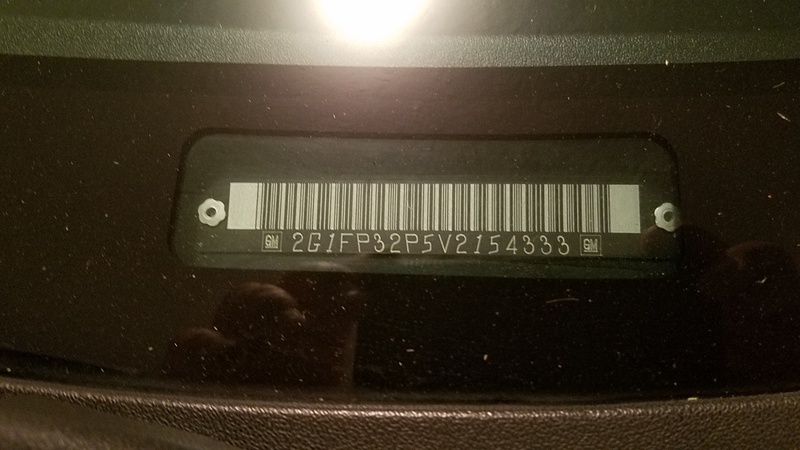 To date, I have found 9 cars still have the complete graphics package, but that is subjected to not always being able to identify the cars using the VIN. Last edited by peterpar; 08-02-2018 at 12:30 PM. Car Club (F-Body or Otherwise) in Indianapolis Area? Quick Reply: Hello from Indianapolis!